By way of explanation, I'm doing some "heavy reading" this fall (classics with 400+ pages) and so I've decided that, for these particular classical works, I'm going to "keep a diary" as I read instead of writing a conclusive book review once I've finished reading any particular book. I have created a Reader's Diary for Wives and Daughters by Elizabeth Gaskall, Jane Eyre, by Charlotte Bronte, and Bleak House by Charles Dickens. This is my fourth and final diary for this year. (But never fear! I'll be back with more Reader's Diary reviews in 2009!) After this chunk of work, I'm taking a break for some more "lazy" reads during the month of December. NOTE: I realized posted this review in one fell swoop, covering all the books together, it would be BEYOND too long. Therefore I'm going to post this review as I read it, book by book. Otherwise none of us would ever get through it. So enjoy The Faerie Queen, Book One review. More to come. Now, to The Faerie Queen. The first question I would ask if I were you is why I chose to read this book. The answer is simple. Lucy Maud Montgomery. Anne loves The Faerie Queen and I love Anne. Hence I am willing to be Spenser's slave for an undetermined period of time if that means further understanding Anne. "What he [Spenser] feels on one level, he feels on all. When the good and fair appear to him, the whole man responds; the satyrs gambol, the lances splinter, the shining ones rise up. There is a place for everything and everything is in its place. Nothing is repressed; nothing is insubordinate. To read him is to grow in mental health." If reading Spenser improved Lewis' mental health then I am willing to take the gamble. 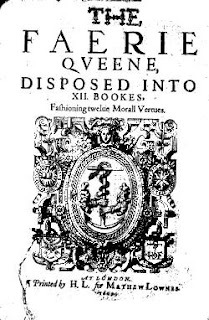 Lewis also said, "Beyond all doubt, it is best to have made one's first acquaintance with Spenser in a very large -- and preferably illustrated -- edition of The Faerie Queen, on a wet day, between the ages of twelve and sixteen." I am neither twelve nor sixteen and I do not have an illustrated version of the text. However, I do live in Oregon, it is fall and therefore it is raining. The closest I can come to taking up Lewis' suggestion is to read The Faerie Queen while it's raining. Therefore I am. Come journey with me! As a little introduction, Spenser meant for this to be an English epic poem which people argued couldn't be done. Epic poems were not meant to be written in English. (Of course, given my love of poetry [i.e., lack thereof] I would argue that epic poems ought not to be written at all, but what of it?) He meant for this saga to be twelve books long but died sometime during the writing of book seven. I will not tell you whether I am grateful or not because this is a reader's diary and I am only partly into the story as I am typing this. We shall see whether or not I celebrate the ending or am sorrowed by the fact that it ended before it was meant to. You can already tell I'm in the middle of reading poetry because I'm using words like "sorrowed" and phrases like "Come journey with me!" Alas. Usually for Reader's Diary reviews I write up something at the end of each reading day. This story is too long for a play-by-play so instead I am breaking things up by book. Do recall that there are seven books so this could become quite long. You've received all the necessary information and disclaimers so let's get started, shall we? BOOK ONE: The Red Knight is a great big loser who wins a great big victory. As a tool to introduce Spenser to me, I used the book Fierce Wars and Faithful Loves by Roy Maynard. This book is published by Canon Press. I found this book to be an excellent tool in introducing Spenser's language (and giving me definitions to unfamiliar words) as well as humorous commentary which brought the story to life. Maynard presents this first book of The Faerie Queen in a humorous and achievable way. As he says in the introduction, "Think of Spenser's poem as the Renaissance poetry equivalent of Roy's Steak. It's not quick and easy, but it's worth the time and effort." Perhaps you'll find that cheesy but I actually found it encouraging. Maynard motivates the reader along through the toughest passages with quips and detailed explanations as to the historical figures Spenser is bringing to light from King Arthur to Sir George. Very helpful and I'm glad my first crack at Spenser received Maynard's helping hand. This particular book can be read in conjunction with the complete edition of The Faerie Queen but also stands alone. Basically Maynard whets the appetite but the first book is conclusive (in some ways). Also, I should note that I made prolific use of Cliff Notes. Let me be upfront on that score! I could not have made it without Cliff Notes. It is true that the further along I got in the story, the less I relied on good ol' Cliff, but it was essential to begin with. Through Fierce Wars and Faithful Loves I learned that Spenser devoted each of The Faerie Queen's separate books to a specific virtue. Book One focuses on the subject of holiness. In this book we are introduced to the Red Cross Knight who is accompanying the fair lady Una (a picture of truth) to her homeland where he ultimately defeats the dragon which is holding her parents captive, thereby winning her hand in marriage. Along the way he is mislead in these adventures by witches, pride and Despair which is the worse of his attackers. Although he proves victorious in his first battle, he succumbs to the god of pride and his future with Una is almost destroyed. Una is a thing of beauty, who even though she is cast aside by the Red Cross Knight, proves true and faithful to him, ultimately bringing him to the place of his salvation. She is cast aside and abandoned by the Red Cross Knight as a result of some treachery. Nature arises in her defence in the form of a lion which rings of Narnia. (Except in this case, Spenser beat Lewis to the punch.) Although abandoned she eventually rejoins the Red Cross Knight through a series of unfortunate events (pardon the pun) which resulted in her coming to his rescue. She travels on with him in the quest to her homeland and stands by him through the attack by Despair. Nor devilish thoughts dismay they constant spright. In heavenly mercies hast thou not a part? Why shouldn't thou then despair, that chosen are? Arise, Sir knight, arise, and leave this cursed place." Casting Crowns' poetry is a bit simplified but nonetheless powerful and true. It is by turning his ear to truth that our hero rises up and is able to win the battle against the fierce and despicable dragon. We all have our trials and this knight has my sympathies. Unfortunately for him, after slaying the dragon and winning Una's hand, he must leave her and go fulfill six years of service to the Faerie Queen herself. And so our journey continues. I so got a kick out of your review. I agree, epic poems shouldn't be written at all! And, if he died while writing these books, shouldn't that be a warning to us? I mean, I think it might be lethal! Kudos for tackling this. Give me Dickens anyday! I applaud you too. The Fairie Queene is on my lifetime tbr list. (Hopefully before my children are between 12 and 16, so they can encounter it at the proper age. ;-) ) But I haven't gotten brave enough to tackle it so far. Two of my daughters read this book - both were 16 when they read it - and liked it. You've inspired me to give it a go, too. Thanks for the interesting review! Interesting journal. I read this long ago for a class, and I admire you for taking it on. So true that those cliff notes are essential at the beginning, then you gradually get used to the language and need them less and less as you move on. After a steady diet of published in 2008 children's novels (working on the CYbils), I'm not sure I'll be able to follow an epic poem of any kind. I'm impressed with your intestinal and reading fortitude. I've never tackled Spenser. But maybe someday. Welcome to the Spenser Club. I will be interested to see where you land at the end of it all! I must admit that in general, Epic poems are not my thing, but this one I find worthwhile. Enjoy! Faerie Queene is very ambitious. I had to read book one three times in college for various Brit Lit focus classes. I still can't pick it up!